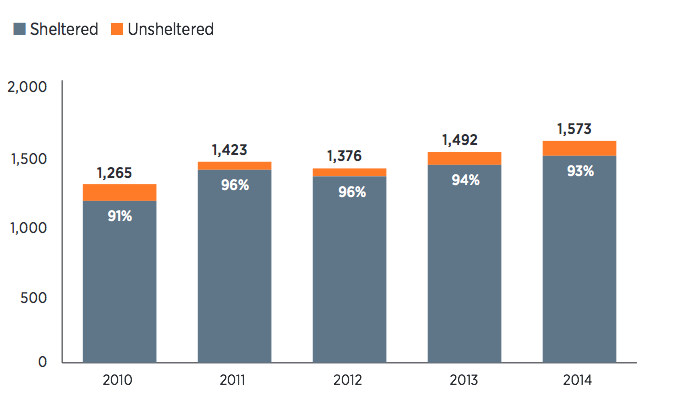 Homelessness has grown in Allegheny County over the last 4 years. Most homeless are in shelters or transitional housing. “It’s about loving your fellow Pittsburgher,” says Jon Potter who wants to create a new kind of homeless shelter. According to the Allegheny County Department of Human Services, the number of homeless persons in the county rose from 1,265 in 2010 to 1,573 in 2014 (up 24 percent). The department reports 93 percent of the homeless were sheltered—either in emergency facilities or in transitional housing. According to Potter, he’s looking for a big house with three units: one for the hostel for travelers that he says is a self-sustaining operation and the other two units for homeless persons—up to 3 individuals per unit. As Pittsburgh deals with single-digit temperatures and subzero wind chills, some organizations are looking out for the city’s most vulnerable — the homeless. There are several warming centers open throughout the city, including the Greenfield Senior Center and the South Side Market house Senior Center. There are also numerous churches and shelters offering a respite from the cold.